Unusual WW2 Russian Soldier’s Forage Cap – Ukrainian Nationalist – German Ally? 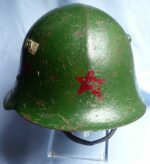 Unusual WW2 Russian Soldier’s Forage Cap. A very unusual WW2 Russian sidecap with distinctive enamelled badge - looks like it could be from a Ukrainian(?) nationalist militia but cannot be certain - identification would be appreciated.